A Samaritan man displays his people's ancient version of the Pentateuch. The Samaritan Pentateuch is the text of the the first five books of the Bible, also called the Torah or Books of Moses, that is used by the Samaritans. It differs from the traditional Jewish version of the Torah in its alphabet, linguistic usage, and its emphasis on Mount Gerizim, the Samaritan high place which competed with Jerusalem as the only authorized place for the worship of the Israelite deity. The Samaritans share with Jews a belief in the Torah and its laws, but reject the rest of the Hebrew Bible. In the Bible, the Samaritans and Jews divided after the Babylonian exile because the Samaritans had intermarried with foreign women and refused to divorce them. The Samaritans, however, believe that they had formed a distinct tradition dating back to long before the establishment of the Israelite kingdoms and that their version of the Torah was copied by Abishah, the great-grandson of the high priest Aaron. Written in the Samaritan alphabet, which is believed to be an ancient form of Hebrew, the Samaritan Pentateuch provides scholars with important information to determine the text of the original Pentateuch and to trace the development of text-families. Scrolls among the Dead Sea scrolls have been identified as belonging to a proto-Samaritan Pentateuch text-type. Samaritans descend from the people who inhabited what the Hebrew Bible calls the northern Kingdom of Israel. According to the Bible, the political division between the southern Kingdom of Judea and Kingdom of Israel took place after the reign of Solomon, with the northern leader Jeroboam I becoming the king of Israel and Rehoboam, the son of Solomon, ruling Judah. The Samaritans, however, maintain that in fact Israel, the capital of which was the city of Samaria, never truly joined the "united" kingdom established by David and Solomon. They also contend that Mount Gerizim, located near the ancient town of Shechem, was the location ordained by God as the authorized site for the sacred altar and temple of Yahweh as described in the Torah. The Temple of Jerusalem was, therefore, never the true temple. Moreover, they rejected the Jewish priesthood as illegitimate, having descended from the false priest Eli of Shiloh, who, according to Samaritan tradition, was originally a priest at Gerizim. They also reject both the northern and the southern kings of Israel/Judah, believing that God did not approve of either royal tradition. The northern kingdom was conquered by the Assyrians around 722 B.C.E., and the southern kingdom by the Babylonians c. 586 B.C.E. Today's Samaritans, by both Jewish and Samaritan accounts, are the remnants of those who were not exiled from the land during the Assyrian period, but who continued to practice a version of the ancient religion of Moses. However, when the Jews returned from Babylonian exile, they rejected the Samaritans because they had intermarried with non-Israelites. The nation of Samaria thereafter became Judea's rival with its own Temple of Yahweh on Mount Gerizim. There were several wars between the Jews and Samaritans in history, on the basis of both religion and politics. Today, only a few hundred Samaritans remain, located in Nablus near Mount Gerizim and in the suburban town of Holon, outside of Tel Aviv. Samaritans accept the Torah—the first five books of the Hebrew Bible, also called the Pentateuch—as authoritative, but reject the writings of the prophets and the other writings which are part of the Hebrew Bible and the Christian Old Testament. Although they have their own supplemental oral and scriptural tradition, they also reject the oral law of the Jews, namely the rabbinical traditions which came to be written in the Talmud. The views of scholars as to the antiquity of the Samaritan Pentateuch vary. Some maintain that the Samaritans inherited the Pentateuch from their Israelite forebears who were left in the country at the time of the Assyrian conquest of Israel in the eighth century B.C.E. In 2 Kings 17, evidence indeed exists for the continued presence of Israelite priests in the area: "Then the king of Assyria gave this order: 'Have one of the priests you took captive from Samaria go back to live there and teach the people what the god of the land requires.' So one of the priests who had been exiled from Samaria came to live in Bethel and taught them how to worship the Lord" (2 Kings 17:27-28). Others, however, hold the view that the Samaritans did not come into possession of the Pentateuch until they were definitely formed into an independent community of the Babylonian exile. It is nearly certain that the Samaritans were already using some form of the Torah at the time of the establishment of their temple on Mount Gerizim, in the time of Nehemiah, but whether this was the Samaritan version or the Jewish version is uncertain. The Samaritans themselves insist that their version of the Pentateuch is the oldest and most authentic. 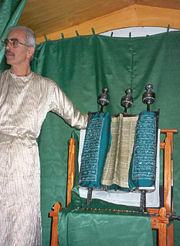 The most celebrated of the copies of the Samaritan Pentateuch is the Abisha Scroll, which is used in the Samaritan synagogue of Nablus. This scroll was allegedly penned by the high priest Abisha, great-grandson of Aaron, 13 years after the Israelites entered the land of Israel under the leadership of Joshua. Abisha claims for himself the authorship of the manuscript in a speech in the first person inserted at Deuteronomy 5:6 in the normal text. Modern scholars doubt that this could actually be the case, but the scroll is definitely of great antiquity. The Samaritan version of the Ten Commandments commands the Israelites specifically to build a sacred altar on Mount Gerizim, which would be the site at which all sacrifices should be offered. The Hebrew Bible does mention Mount Gerizim as a sacred place, but in a different context: "When the Lord your God has brought you into the land you are entering to possess, you are to proclaim on Mount Gerizim the blessings, and on Mount Ebal the curses" (Deuteronomy 11:29). It goes on to describe the establishment of an altar on Mount Ebal, but not on Mount Gerizim. 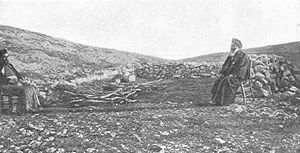 In addition to the emphasis on Mount Gerizim, differences between the Samaritan and Jewish versions of the Torah include minor issues such as the ages of various personages, and important legal matters such as a Samaritan law requiring monogamy as opposed to the Hebrew tradition of allowing more than one wife. The Samaritan Pentateuch is written in the Samaritan alphabet, which differs from the biblical Hebrew alphabet. It is considered by some to be the form in general use before the Babylonian captivity. However, comparisons between the Hebrew Masoretic text, the Greek Septuagint text, and the Samaritan version of the Pentateuch indicate that the Samaritan version is more closely related to Septuagint. In about 2,000 out of the 6,000 instances in which the Samaritan and Masoretic texts differ, the Septuagint (LXX) agrees with the Samaritan. For example, Exodus 12:40 in the Samaritan and the LXX reads: "Now the sojourning of the children of Israel and of their fathers which they had dwelt in the land of Canaan and in Egypt was four hundred and thirty years." In the Masoretic text, the passage reads: "Now the sojourning of the children of Israel, who dwelt in Egypt, was four hundred and thirty years." Scholarship since the discovery of the Dead Sea Scrolls in the mid-twentieth century, however, have led to new insights and debates regarding the text's relationship to other versions. In the early Christian centuries, the Samaritan Pentateuch was frequently mentioned in the writings of the Church Fathers and in marginal notes to old manuscripts, but in the course of time it was forgotten for more than a millennium. 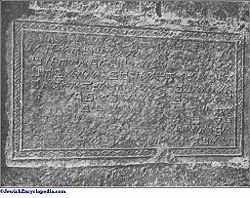 Ancient inscription in Samaritan Hebrew, from a photo c.1900 by the Palestine Exploration Fund. 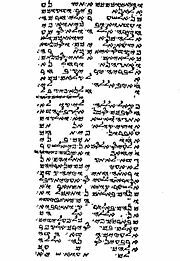 Wider interest in the Samaritan Pentateuch commenced in 1616, when the well-known traveler Pietro della Valle purchased a copy of the text at Damascus. This copy, now thought to date from about a century earlier, came into the possession of the library of the Oratory at Paris and was printed in 1645 in the Paris Polyglot in an edited version by Jean Morin. A Jesuit convert from Calvinism to Catholicism, Morin believed that the Septuagint and the Samaritan texts were superior to the Hebrew Masoretic text. It was republished again in Walton's Polyglot in 1657. Since then many copies, some of them much older than della Valle's, have come to Europe and America. Scholarly evaluation of the Samaritan Pentateuch—which earlier tended to view it as more modern than the Masoretic text—has changed after the discovery of the Dead Sea Scrolls, some manuscripts of which display a text that corresponds closely to that of the Samaritan Pentateuch. This shows that, apart from the clearly Samaritan references to such issues as the worship of God on Mount Gerizim, the distinction between the Samaritan and Jewish versions was not as clear-cut as previously thought. The first English translation directly from the oldest Samaritan text was expected to be published by late 2008 by Benyamim Tsedaka, an active member of the Samaritan community. ↑ Meson, Overview of the Differences Between the Jewish and Samaritan Versions of the Pentateuch. Retrieved January 16, 2019. Anderson, Robert T., and Terry Giles. Tradition Kept: The Literature of the Samaritans. Peabody, MA: Hendrickson Publishers, 2005. ISBN 9781565637474. Watson, William. Samaritan Pentateuch Manuscripts: Two First-Hand Accounts. Piscataway, NJ: Gorgias Press, 2007. ISBN 9781593338923.